Big Red Car here. 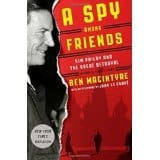 Been reading a great book, A Spy Among Friends: Kim Philby and the Great Betrayal. If you have any interest in learning how the spy game got started and has become what it is now, this is a required reading foundation book. The book is all about relationships and friendships so you really don’t need to know anything about espionage to get the story. It is also beautifully written and the story holds one’s attention like a Grisham novel. It is a true story. Just before World War II, a coterie of English slightly upper class students at Cambridge were flirting with communism in a sort of high jinks college way. Several of them became full on spies for the Russians. None had ever visited Russia. None really knew anything first hand about Russia and all had lived lives of privilege. The story is well known to anyone who has ever studied espionage or been around the game. For decades the Russians had such a deep pipeline into MI6 (British CIA) that the Russians began to believe that Kim Philby was a double agent. The Brits had been running brilliant double agent operations against Hitler all during World War II. His information was too good and too much. The results were a disaster with three of the four defecting to Russia and all of them having betrayed their countries for decades. Philby was the senior MI6 person in the US when the first cracks began to appear in his armor with the defection of two of the others — one of whom with which he was quite close. Philby knew all the Brits and Americans secrets and gave them in detail to the Russians. The intelligence breach was complete and absolute. It took some time for this all to be admitted as it was so embarrassing. Philby was so convincing that he survived several interrogations and was welcomed back into MI6 after the defections. A blunder of incredible proportions. He ultimately defected to Russia. The big teaching point is to see how the most minimal background investigation and due diligence would have uncovered the risk long before Philby sent thousands to their deaths with his treachery. What this book cannot answer and nobody has really been able to answer is WHY? Why did four well off snots who had never lived a day under communism and who had never visited Russia decide to betray their country in such a wholesale manner? And to the Russians of all people? It is a striking example of how and why intelligence agencies should be incredibly skeptical in their recruitment and vetting processes. It is a very good read. But, hey, what the Hell do I really know anyway? I’m just a Big Red Car. This entry was posted in Uncategorized and tagged book, kim philby, spies. Bookmark the permalink. Asking For And Getting A Raise II — Guaranteed! I will get the book now. Thank you. I have often wondered how much data-driven or at least data-informed approach they use in vetting people. Are there patterns that predict with some statistical significant the probability of someone being a good bet or a risk of betrayal? The recruitment of spies today is a science that begins very early. I have some knowledge of this having been to a school that supplies quite a few to the CIA. Today, you have to “not be disqualified” rather than be qualified. Once upon a time, a Princeton degree was enough to get in. No longer. In those days — Philby being the poster child — it was all about your “people” and this is why the Philby, Maclean, Burgess, Blunt, Caingross crowd was such a fiasco. These guys stole every secret for decades and gave them to the Russians wholesale. The Kim Philby story is a fascinating story of betrayal. Nobody has ever really been able to answer WHY? This book breaks no fresh sod but it does put it into the context of his relationships and friendships which is very useful.